Majors G.A. Burton, Governor General’s Horse Guards, and R.F. Sneyd, Canadian Chaplain Service, reading General H.D.G. 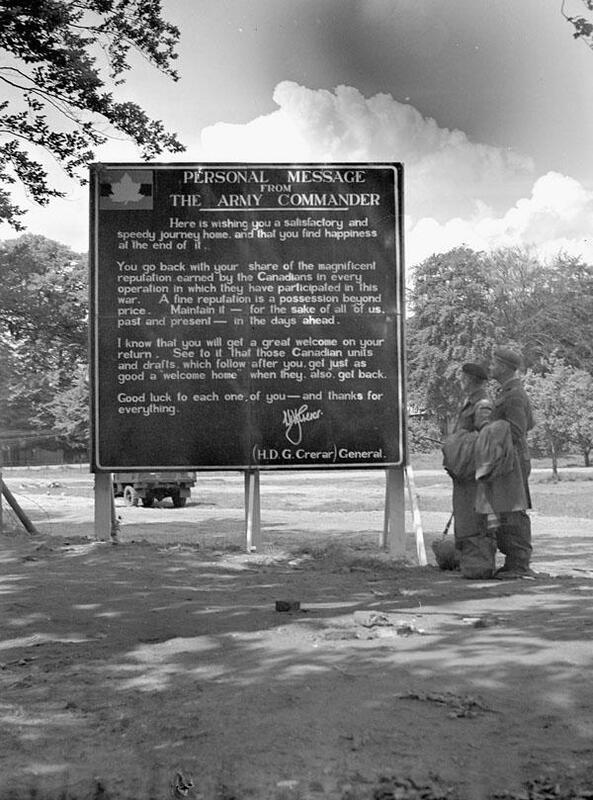 Crerar’s farewell message to Canadian troops, Nijmegen, Netherlands, May 31rst 1945. Here is wishing you a satisfactory and speedy journey home, and that you find happiness at the end of it. You go back with your share of the magnificent reputation earned by the Canadians in every operation in which they have participated in this war. A fine reputation is a possession beyond price. Maintain it - for the sake of all of us, past and present - in the days ahead. I know that you will get a great welcome on your return. See to it that those Canadian units and drafts which follow after you get just a good a "welcome home" when they, also, get back. Good luck to each one of you - and thanks for everything.